Choosing the best host is hard. As a small business, you need the best balance of price and features. But diving into the mystifying world of web hosting and content creation is intimidating for experts, let alone the average buyer. That’s why we’re here to walk you through the ins and outs of web hosting as well as give our recommendations for stellar hosting providers. How do I start getting my business online? How do I know what host I should pick? How do I get my domain name? What are the basics I should look for in my web hosting provider? Getting up and online can be intimidating and takes a bit of skill, but you wouldn’t be a small business owner if you didn’t find opportunity in those challenges. The average person is unaware of the immense opportunity that modern websites offer businesses. There is more reason to go digital today than ever before. How can a website supercharge your small business revenue? Gathering data: The latest tools will tell you very important information about user engagement. For instance, did they put something in the cart but stop from making a purchase? Do parts of your site sit stagnant and unused? Do users stop clicking on content within seconds? How long do they spend on your site? This data can change your business in ways you never dreamed. Make your name known: Improving your website’s SEO and social media follower count (Insta-famous anyone?) is one of the most effective ways to drive traffic to your business quickly and easily. Stop misinformation: Digital solutions save on man-hours as you can post frequently asked questions and have timeless information such as store hours readily available. Creative solutions for every problem: Whether it’s promoting projects, building a storefront for online sales, or listing your tour dates for the band. A website can be whatever you want and solve whatever problems you have. Future Proof your brand: The internet isn’t going away. If your small business is still running offline. A competitor will fill that void and take away valuable customers. It may feel overwhelming at first but getting your small business online can be broken down into three oversimplified steps. 1. Define your online presence: First, research and think through what type of website you need. You may need an E-Commerce site with carts and unique features or be advertising a law firm and care mostly about driving a specific audience to your web presence. Defining your online presence depends on your individual business. 2. Choose a web hosting solution: This will depend on what your needs are as a business. Small business web hosting typically consists of a mid-range hosting solution as the more expensive options have features that a normal business owner may never use. 3. Build and design your online presence: Building your website depends on what you are desiring to invest in your online platform. None of these steps are easy or quick. They’re broad and may take a ton of time and investment to finish. They are basically the broadest way to get your online presence up and running though. Today we want to help you take care of that confounding second step, choosing your web hosting solution. The second step, selecting a host, is where many enthusiastic business leaders get overwhelmed, stop, and never get online. There’s a dizzying array of hosting options available and since hosting is such a foundational step in developing an online presence, it can be easy to be discouraged from starting anything. Websites don’t float around an ethereal cloud or actually exist on some intangible world wide web. Every time you access a website, you are actually connecting with a physical computer somewhere (a server) that stores information and manages website access. Modern computers can also simulate these servers by running a program (known as a virtual machine) but technically they’re still running a program on physical hardware. 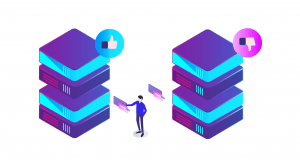 A web hosting solution is simply how you get a physical computer to manage, store, and connect your website to the internet. This is primarily done through web hosting providers such as A2 Hosting that manage hundreds or thousands of computers filled with various websites. Unless you are very technically experienced, we can tell you right now that your best web hosting solution likely involves paying a web hosting provider to store your website and connect it to the internet. It’s simple, cost-effective, and far more effective than attempting to run your own server system at the office or home. For those brave ones or techies who want to try an in-house DIY solution though, WhatsTheHost has written a step-by-step article on web hosting at home. Every business owner will have different needs. Some hosts are better suited for those building high-traffic websites such as online shops while other hosts are great for bloggers and those needing more data-oriented tools to gain readers. We break down our favorite web hosting providers below so you can make an informed decision. To pick a host, you’ll want to consider the purpose of your website, the platform you want to build it on (Such as WordPress, developing your own website, or using a DIY website builder), and how committed you are to the process. We recommend familiarizing yourself with our top three hosts and seeing if they might fit your needs. You’ll also want to consider getting a domain name squared away as paying for a host often involves selecting one. A domain name is simply the term that you put into a browser to pull up your website. For instance www.amazon.com or www.google.com. These addresses are registered for a period of time and a complex market dictates how costly domain names are as well as availability. You need to decide how important your domain name is and whether you want something cheap, random, or cheesy rather than paying the large costs associated with getting your proper business name or dream domain. Web hosting providers commonly provide free or discounted domain names if you choose them, but be aware that many domain names belong to specific companies such as Godaddy (Meaning you may need to work with multiple companies to launch your website). If you are stuck, perhaps try out one of these domain generators. They help find a good name without blowing the budget or wasting hours trying to be creative. Nearly every provider will tout these essentials as features. It’s important to make sure you select a web hosting provider that offer these features. The universal expectation is that these are minimum requirements for a good host. If your host can’t provide these simple things, avoid them! Additionally, if these are the only features that make them stand out, find a better host. Your host should always be available if something goes wrong, almost never lose service, and offer options beyond simply storing your website. We can’t get enough of SiteGround. The first thing you’ll notice with SiteGround is the attention placed on customer service. Web hosts can be a pain to deal with when things go wrong. Nothing kills your momentum like sitting in an empty customer service chat room while your online store is down and sales are plummeting. Despite being a small independent company, SiteGround has the same feel as the greats (Amazon, Google) with the customer service of a mom and pop shop. If you don’t know what one-click staging is, you need to know. Changing a website can be painful ESPECIALLY if you don’t have a test platform where you can see if changes work. One-click staging allows you to test changes on your site before bringing them live. This feature alone makes SiteGround worth the investment as you can maintain a sense of stability when making changes to your site and avoid awkward downtime from pushing a live update. Note that you do have to purchase a whole year rather than monthly but as a small business owner that’s not a big problem. Bloggers and those testing the water may want to go with a monthly option though. Check out our in-depth review if you want to know a bit more about them, we can’t recommend them enough. Not a good choice if you aren’t committed to using WordPress. The biggest mistake beginners make? Getting too cheap with web hosting. Some will compare WP Engine’s $35/mo plans with some rock-bottom prices that are as shockingly low as under $2 a month. Guess what – you get what you pay for. If you run a real business, you WANT to pay more. You want to know the hosting company is going to make a profit and invest in their technology. Guess what, if your cheap host gets hacked, you’re paying a web developer upwards of $100/hr (in the U.S.) to fix it. There goes your savings. Technically WordPress is a free open-source content management system, which is a techie way of saying that anyone can use and modify the software for free. This has it’s pros and cons. It’s a very powerful tool that gives users access to plug-ins, widgets, user-designed content options and more. But the major drawback, is that being so open-ended, anything can happen. That means if you aren’t a developer, your WordPress site on a cheap host can get spammed, hacked, and run slower than a snail on gravel. To help host and manage this, WP Engine supercharges WordPress with their built-in customizations. They consider themselves a web experience platform that is more than a host. What this means is that they have a team of WordPress engineers that uses their custom platform to add speed optimizations, hacking prevention, and top tier support to make your website stronger than doing it yourself. It’s a bit pricier but those who want to use WP will fall in love with WP Engine and all the features they offer. If you are into the DIY nature of WordPress, WP Engine is a must. WP Engine is more expensive than other hosting options because it offers extreme speed, great tools, automatic backups and more. The most bizarre drawback is a lack of support for domain-based emails. They awkwardly suggest using Gmail but hopefully that will change as they grow (They updated customer service recently to 24/7 which is fantastic). To be honest though, we go with Gmail for everything, so it’s not that much of a drawback. If you aren’t using WordPress, it might be worth looking elsewhere but it’s a must for those who are. Our full review goes even more in-depth on their features. A2 Hosting stands out for one thing. Nothing makes your website visitors downright angry like slow load times. Even a few extra seconds can cost you hundreds of customers. A2 Hosting is blazing fast and offers the full suite of features we expect from a web hosting provider such as 24/7 customer support, uptime guarantees, and excellent tools. A2 is a really good option for those with weighty web designs that need to get data to the consumer quick. They offer great email support and are good with WordPress as well, which keeps them competitive with WP Engine. As a host, they’re a great compromise between the cheap all-around features of SiteGround and the expensive WordPress focus of WP Engine. They also have proprietary security solutions and can be trusted to remain up more than almost any other hosting service, the daily backups don’t hurt either. Starting an ecommerce site that isn’t on Shopify (why?). A2 supports PrestaShop, Magento, OpenCart, WooCommerce and many more. Check out more A2 Hosting details on the full review. These web hosting providers are widely used popular options that have stood the test of time. Bluehost is commonly name-dropped on popular blogs and famous podcasts – it’s a mass-market host that appeals to a lot of people. For those using price as the most important factor for deciding your host, Bluehost is one of the best options. It’s also one of the lowest risk options for beginners who are just jumping into building their first website. Bluehost has fantastic security and tools that beginners love to use. They also offer VPS hosting at an affordable price. Bluehost does struggle in a couple of areas. First, they don’t offer an uptime guarantee. That means you won’t get compensated if Bluehost goes down. While this is a very rare occurrence, the risk isn’t worth it for businesses such as e-commerce that lose money every minute a site isn’t up. They’re the only provider we recommend who doesn’t make that basic requirement because of all the other things Bluehost does well. Bluehost is a decent choice but long-term users may find themselves outgrowing them as host as well. That makes the cheap long-term pricing a little less valuable. The full Bluehost review dives into even more details. Even if you go with another web hosting provider, chances are you’ll encounter Godaddy along the way. They’re probably the most well-known provider around. They’re famous for buying an insane amount of domain names and raunchy super bowl ads that made them memorable for all the wrong reasons. For business professionals short on time who want to only go through one company, there is a good chance Godaddy will meet your needs for both a host and domain name. GoDaddy checks the boxes for 24/7 phone support, affordable starter pricing, and a decent amount of features. One unique feature is the web design team that Godaddy employs. For those willing to pay a bit more, they’ll design your website and help you get a web presence quickly. Worth it for those who just don’t have the time or skills to build a site, but have the budget. The full GoDaddy review dives into more nuances. Inmotion Hosting is a solid option for web hosting and has been around for nearly 16 years. With a history of great performance and all the features, you’d expect from a web hosting provider. They don’t flaunt killer features that make them stand out but Inmotion is affordable, popular, and dependable. Inmotion is upfront about being a bit more on the technical side than other hosting services and likes to support open source solutions. They’re fantastic for those who know a bit about building a site and hosting it beforehand. It has a steeper learning curve than some providers but allows for some unique freedoms. They also have SSD hosting which is far faster than traditional HDD hosting. The biggest downside is for Inmotion is that they aren’t always the clearest on pricing and data limits, so it’s important to research your package and talk with customer service about any questions you may have. The full Inmotion review dives deeper than you want. Hostgator is a very cheap option (as in less than $3/mo) that offers great tools, good support, and a generous money-back guarantee. The biggest advantage offered by Hostgator is the lack of risk. They give loads of free incentives such as Adwords credits and SEO tools. They also give free trials of popular hosting features such as cPanel. With HostGator you get to experiment without spending a bunch of additional cash. They’re similar to Godaddy in that Hostgator is a huge, well-known provider with fantastic features. Unlike Godaddy, they didn’t use crude marketing tricks to become well known. Rather they just offer good service with the features you want. With unlimited email addresses and all the free tools, they’re probably our favorite pick for those who want to experiment with web analytics. They have everything from shared to WordPress, VPS, and cloud hosting. Those just starting will do fine with shared hosting though. Our HostGator review dives into the dizzying amount of options. Dreamhost does one amazing thing that other hosts don’t: free non-profit hosting. It takes a bit of paperwork but for those 501(c)(3) that are scraping by, nothing beats free! They’re a good hosting service and we appreciate how honest and upfront they are about words like unlimited. Most providers through that around but still throttle bandwidth or charge extra through nefarious means. Dreamhost is just a friendly hosting service. They offer some varied options such as WordPress and Website builder services as well as remain quite affordable. Our biggest concern is that Dreamhost doesn’t offer phone support. Using a quick and decent email ticketing system works but larger businesses with immediate concerns may find themselves frustrated by the lack of customer service. Check out the full Dreamhost review for more fresh details. Selecting a web host is complex enough but you’ll also need to select your type of hosting. Shared Hosting – These are the cheapest option and best for companies that don’t have much invested in web development. Shared sosting means that your website resides on one physical computer with several other websites. The upside is a cheap price and mostly standard hosting. The downside is that these other websites aren’t separated out from yours and if they crash the server, get attacked, or have any large number of problems, it’ll start to affect your service. They also may limit bandwidth and occasionally charge you if something causes you to need more space (Such as unexpectedly going viral). Cloud Hosting – It’s the buzzword of the decade (“stored in the cloud”) – but what does cloud hosting even mean? So essentially, it spreads out risk – you’re not relying on one machine – and allows for extreme scalability. VPS Hosting – VPS Hosting or virtual private server is a hybrid of shared servers and dedicated servers. Modern servers can run VM’s or virtual machines. These programs simulate an entire operating system while remaining stable and isolated from other websites. That means that a huge spike in system resources won’t start cutting into other websites on a server. 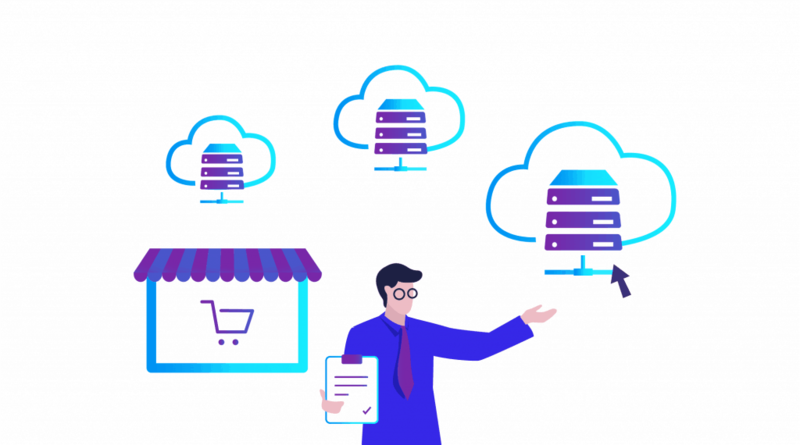 Advanced VPS cloud hosting solutions are designed to scale with demand as well meaning that you’ll pay less money when your site is not used as much, and you’ll still remain stable after a large spike in traffic. WordPress Hosting – What is WordPress Hosting? In reality, WordPress hosting is simply shared or cloud hosting, but optimized for WordPress. This means that the server technicians tweak servers to work best with WordPress, stuff that’s over my head (and yours). Let’s just say if you are sold on WordPress, this is probably the way to go. Hosts that offer this allow the WordPress CMS to be installed on the server and work really well with offering all the tools you’ll need for a WordPress based site. We definitely recommend WP Engine for those interested in WordPress hosting! Business Hosting – What is Business Hosting? This is just an industry term meaning that a host caters to businesses and offers features a business website might need. In general, you should expect your host to treat you as a business regardless of whether or not you are large or small! Dedicated Hosting – This is the most expensive option and generally means that your website is the only one on a server. Large companies or businesses doing massive amounts of e-commerce love dedicated hosts because they are the most reliable and you can guarantee other websites have no chance of impacting your service. They’re costly but if you absolutely need to stay online, dedicated is the way to go. There isn’t likely a reason that you’ll need to consider this as most hosting is done through Linux, but some web hosting providers also use Windows for web hosting. As you grow in your technical skills, this may become more important. For now, it is best to focus on choosing a solid small business host that meets your budget and features, and most of these are on Linux. Your business has unique needs that differ from other businesses. If you sell products online, you might need strong security certificates and integration with payment providers. If you’re running a news site with millions of pages and photos, you’ll probably need large amounts of storage space. You should do your research to get the best bang for your buck, but in reality if you choose one of the hosts mentioned on this page, you’ll be in good hands. Running a small site and you want low prices and great support? Go with SiteGround. Are you a profitable business based on WordPress? Go with WP Engine. Pick one of those two and get on with your life!